We are proud. Really proud to announce an important metric. 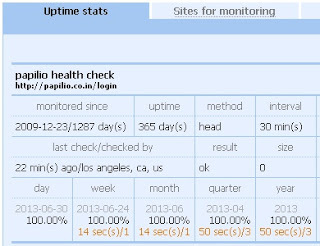 As you all know, Papilio is a cloud based practice management system. Being on cloud, we have to make sure Papilio is available, always. There is no compromise on that. We work extensively on making sure you have uninterrupted access to your work (we call it virtual office). And in this half of the year, we achieved it and we would love to share this news with you all. We have a goal of achieving 99.99% availability. And, our continuous effort in making it happen, we are proud to share with you this beautiful number. 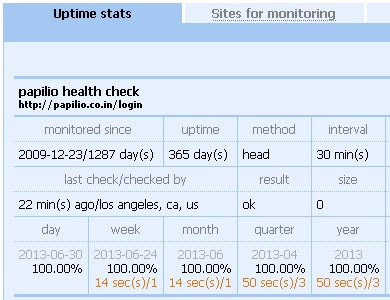 As per our up-time tracker (we use host-tracker), this year, until now, we reached best score possible. You guessed it right. 100%. We met our goal. In fact, we surpassed it. We are pretty confident, we are in elite league of service providers in providing such availability. Thanks to the team who made it happen. We love to provide this level of service for ever and thank you for being part of it and giving us the opportunity to serve you better.